Everyone loves apples, and when the air starts getting a little cooler and the fall months began to roll in, apple picking season is finally on the way. There’s nothing quite like heading out with family or friends and spending a day roaming around an orchard, filling up bags and baskets with freshly-plucked apples and imagining all of the sweet treats you’ll be able to make with them. Apples have dozens of uses, from simple tarts and pies to sauces, ciders, donuts, ice creams, and more. Apple picking is popular in plenty of areas around the United States, with Minnesota being a prime apple-picking location. If you happen to live or plan on visiting the area around the Twin Cities of Minneapolis and St Paul, there are plenty of super apple picking orchards and farms to be found. Apple orchards in the Minneapolis and St Paul area grow a lot of different apple varieties including Honeycrisp, Haralson, Red Delicious, McIntosh, SweeTango, Whitney Crab, Lakeland, and many, many more, along with other activities like tractor rides, pony rides, and general stores. There are plenty of great apple orchards to be found near the Twin Cities, with each one offering its own apple varieties and activities for all the family to enjoy. Read on to learn some important information and contact details for the best apple orchards in the area. With more than 200 acres of land, Afton Apple Orchard is a highly popular and successful fruit farm with a big focus on apples. The farm also offers strawberries, raspberries, pumpkins, peaches, and more, but apple picking season at Afton Apple Orchard begins in August and runs through to the end of October. An annual Apple Festival is held at this location each year too and admission is very reasonably priced. Apple varieties at Afton Apple Orchard include Paula Red, Zestar, Cortland, Sweet 16, Haralson, Honey Gold, Estival, McIntosh, and many more. The orchard also has a corn maze, petting zoo, and a farm store selling all kinds of treats and natural produce. For a full day of apple picking fun, head on down to Emma Krumbee's Orchard and Form in Belle Plaine, MN. This apple picking orchard offers so much more than simple apple picking, with an on-site general store, farm market, bakery, and restaurant offerng all kinds of home-made, traditional American classics. Attractions and events at Emma Krumbee's include a maze, petting zoo, and tractor rides, as well as fun scarecrow festivals in the fall each year. Guests can pick their own apples, raspberries, and pumpkins, with apple varieties including Haralson, Zestar, Regent, and Macoun. For some of the best apple picking in Minneapolis and St Paul, visit Emma Krumbee’s. Offering much more than just apple picking, Minnesota Harvest Orchard is located in the pretty little town of Jordan and runs its own petting zoo and playground for the kids, as well as a corn maze and horseback riding. Live music and special events are always scheduled on the Minnesota Harvest calendar, so you keep coming back and enjoying new experiences every time. As for the apples, this is one of the best locations near Minneapolis and St Paul as it offers a simply huge variety of apples, including some varieties that are totally unique to this farm like Creme d'Licious, Golden Haralson, Doc, Golden Earl, Live Music, Plum Crabbie, Sugar Shack, and more. 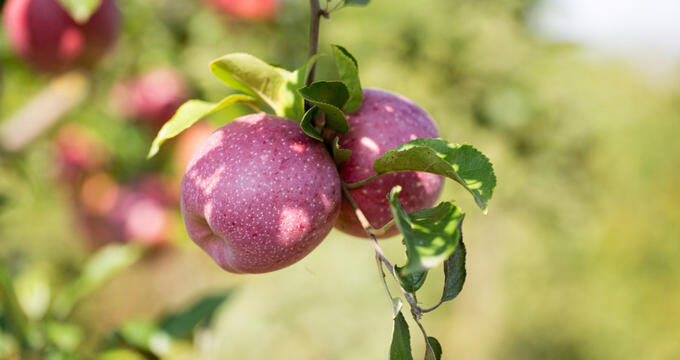 Established over four decades ago, Minnetonka Orchards is one of the best apple picking states in all of Minnesota and is a very popular gathering location for locals and tourists alike. This orchard provides a lot of different apple varieties to choose from, including Haralson, Macoun, Honeycrisp, and more, along with a wide range of additional activities to fill out your day like a corn maze, hay mountain, playground, petting zoo, and more. Scenic walk trails can also be enjoyed around the orchard and various special events like Cider Fest and Summer Movie Nights are also held at this beautiful location, which is a very popular place for weddings, birthdays, office outings, and school trips.